Today, Governor Rick Scott urged the legislative commission charged with granting spending authority to approve $340 million in federal funding to aid Florida’s citrus growers. Earlier this year, following months of Governor Scott fighting for critical funding and support for Florida’s citrus industry, the U.S. Department of Agriculture (USDA) announced $340 million in federal funding to aid the Florida citrus industry’s recovery from Hurricane Irma. Now that a grant for this funding has been approved in an agreement between the USDA and the State of Florida, it will be considered by the Florida Legislative Budget Commission (LBC) tomorrow. The block grant for Florida citrus is part of a more than $2.3 billion federal package approved earlier this year. Today, Governor Rick Scott announced the reappointments of Bruce Laishley, Jonathan Martin, and Danny Nix to the Florida Southwestern State College District Board of Trustees. Today, Governor Rick Scott announced three appointments to the Eleventh Judicial Circuit Court. Judge Dawn V. Denaro, 51, of Miami, is a county judge for Miami-Dade County, and previously served as an Assistant State Attorney for the Eleventh Judicial Circuit. She received her bachelor’s degree from Tulane University and her law degree from Thomas M. Cooley Law School. Denaro fills the vacancy created by the resignation of Judge Jerald Bagley. Judge Andrea Ricker Wolfson, 45, of Miami Beach, is a county judge for Miami-Dade County, and previously served as an Assistant State Attorney/Special Assistant U.S. Attorney for the Eleventh Judicial Circuit Court. She received her bachelor’s degree from the University of Notre Dame, her master’s degree from Southern Illinois University at Edwardsville, and her law degree from Chicago-Kent College of Law. Wolfson fills the vacancy created by the resignation of Judge Antonio Marin. Judge Renatha Francis, 40, of Miami, is a county judge for Miami-Dade County. She previously practiced with Shutts & Bowen, LLP, and served as an attorney for the First District Court of Appeal. She received her bachelor’s degree from the University of the West Indies and her law degree from Florida Coastal Law School. Francis fills the vacancy created by the resignation of Judge Sarah Zabel. Today, Governor Rick Scott attended a roundtable hosted by Puerto Rico Lieutenant Governor and Secretary of State Luis Rivera-Marin, where he offered assistance and guidance on their ongoing recovery from Hurricane Maria. At the roundtable, Gov. Scott was joined by Florida Division of Emergency Management Director Wes Maul and Florida Department of Economic Opportunity Executive Director Cissy Proctor, as well as Puerto Rico business leaders. · On September 28th, at the request of Puerto Rico Governor Ricardo Rosselló, Governor Scott traveled to San Juan, Puerto Rico to help coordinate response and recovery efforts following Hurricane Maria. · On October 5th, the Governor entered into a host-state agreement with FEMA – Florida is the only state willing to enter into this type of agreement to help families displaced by Hurricane Maria. · On October 11th, Governor Scott met with Chairman of the House Appropriations Committee Congressman Rodney Frelinghuysen, Chairman of the House Committee on Agriculture Congressman Mike Conaway, Chairman of the House Committee on Homeland Security Congressman Michael McCaul, and Congresswoman Jenniffer González-Colón. · On October 30th, the Governor’s office sent a letter to the Office of Management and Budget. See the letter HERE. · On November 3rd, Governor Scott led a delegation of Florida utility providers to Puerto Rico at the invitation of Governor Ricardo Rosselló. · On November 9th, the Governor activated the State Emergency Response Team to assist families displaced by Hurricane Maria. See the Governor’s press release HERE. · On November 15th, the Governor sent a letter to U.S. Senate Majority Leader Mitch McConnell and House Speaker Paul Ryan urging them to support Florida’s efforts to support those displaced from Puerto Rico by Hurricane Maria. See the Governor’s letter HERE. · On December 21st, Governor Scott spoke with Congresswoman Jenniffer González-Colón regarding Puerto Rico’s recovery from Hurricane Maria. · On December 22nd, Governor Scott spoke with U.S. Department of Homeland Security Secretary Kirstjen Nielsen regarding recovery efforts for Florida and Puerto Rico. · On January 3rd, Governor Scott sent a letter to the United States Senate Committee on Appropriations urging the Senate to immediately pass a significant Hurricane Irma and Maria disaster relief package. See the Governor’s letter HERE. · On January 11th, Governor Scott spoke with Federal Emergency Management Agency (FEMA) Administrator Brock Long regarding the FEMA Transitional Sheltering Assistance (TSA) program and the importance of continued communication between federal, state and local partners as families continue to recover from Hurricane Maria. · On January 12th, Governor Scott met with Governor Ricardo Rosselló and joined him for a Puerto Rico recovery town hall meeting to discuss ongoing relief efforts. · On January 24th, Governor Scott, Texas Governor Greg Abbott, California Governor Jerry Brown and Puerto Rico Governor Ricardo Rosselló issued a joint letter urging the U.S. Senate to improve and expeditiously pass supplemental disaster funding, and for Congress to send the bill to the President. See the letter HERE. · On February 5th, Governor Scott visited Puerto Rico with Governor Ricardo Rosselló to assist with ongoing Hurricane Maria recovery efforts. · On February 7th, Governor Scott spoke with FEMA Administrator Brock Long regarding Governor Scott’s recent trip to Puerto Rico. 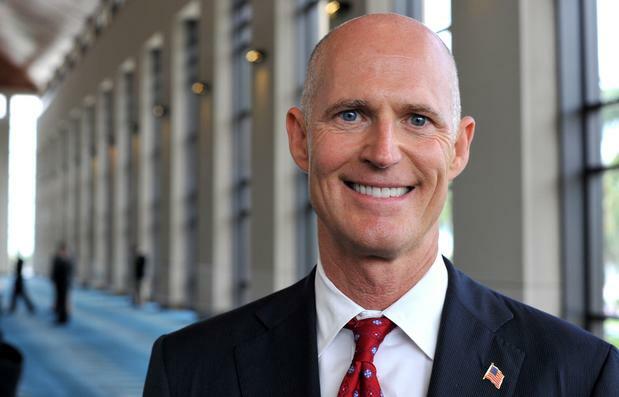 · On February 7th, Governor Scott announced a new partnership to connect families displaced by Hurricane Maria with jobs in Florida. See the announcement HERE. · On March 5th, Governor Scott traveled to Puerto Rico to meet with Congresswoman Jenniffer González-Colón and attend the Puerto Rico State of the State Address. · On April 18th, Governor Scott met with Congresswoman Jenniffer González-Colón in Washington D.C. to discuss how Florida is working to help Puerto Rican evacuees in the state. · On April 18th, Governor Scott also spoke with FEMA Administrator Brock Long to discuss the FEMA Transitional Sheltering Assistance (TSA) program and the importance of keeping the FEMA case managers the Governor previously requested on the ground across the state. · On May 18th, Governor Scott announced that Florida Department of Education Commissioner Pam Stewart would travel to Puerto Rico on May 20th to meet with Puerto Rico Department of Education Secretary Dr. Julie Keleher and offer continued guidance and support. See the Governor’s announcement HERE. Yesterday, Governor Rick Scott announced nearly $10 million in awards for six Florida Job Growth Grant Fund projects. The Florida Job Growth Grant Fund, established by Governor Scott and the Florida Legislature last year, provides $85 million for improving public infrastructure and enhancing workforce training in Florida. The Florida Department of Economic Opportunity (DEO) has received more than 246 proposals requesting more than $866 million in funding. Yesterday’s announcement reflects a total of nearly $70 million in funding awarded to 27 communities across the state to promote infrastructure and job training since 2017. For more information about the Florida Job Growth Grant Fund, visitwww.FloridaJobs.org/JobGrowth. Today, Governor Rick Scott announced nearly $10 million in awards for six Florida Job Growth Grant Fund projects. The Florida Job Growth Grant Fund, established by Governor Scott and the Florida Legislature last year, provides $85 million for improving public infrastructure and enhancing workforce training in Florida. The Florida Department of Economic Opportunity (DEO) has received more than 246 proposals requesting more than $866 million in funding. Today’s announcement reflects a total of nearly $70 million in funding awarded to 27 communities across the state to promote infrastructure and job training since 2017. Today, Governor Rick Scott visited Hall Hardware in West Palm Beach, where he spoke about the beginning of the 2018 Hurricane Season and how important it is to be prepared. 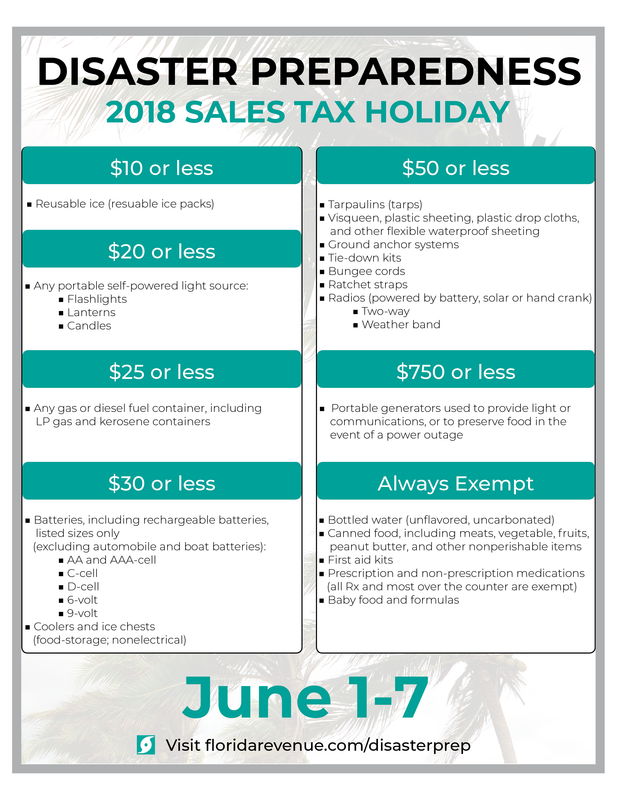 He highlighted the disaster preparedness sales tax holiday that will begin this Friday, June 1st and go through June 7th. During this holiday, Floridians will not pay sales tax on flashlights, batteries, generators, and other critical supplies needed to stay prepared during a disaster. This holiday will save Florida families $5.8 million. Since Governor Scott has been in office, taxes have been cut nearly 100 times, saving Florida families over $10 billion. To see a list of disaster preparedness items that are tax free June 1st through 7th, CLICK HERE.